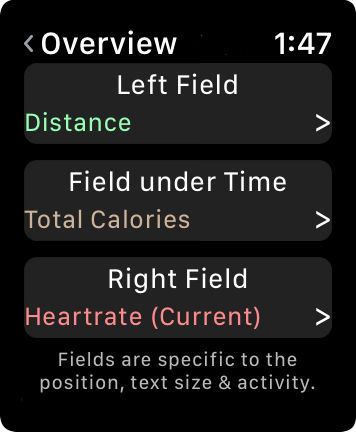 WorkOutDoors is full of powerful features such as interval notifications, limit alerts, heart rate zones, target pace, rolling pace, calorie burn rate, and manual or automatic laps. Multiple data screens can be configured, with full control over layout, text size and content (from a pool of 160+ metrics). Simply triple-tap the display to cycle through the screens. 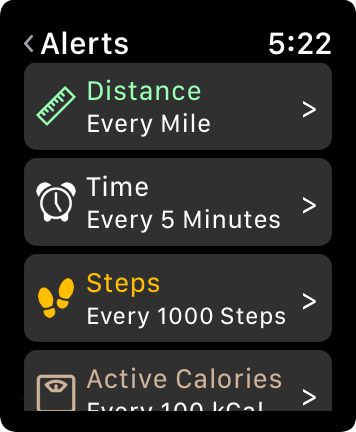 Workouts are automatically saved to Apple's Health system for analysis in the Activity app, and can also be exported for use in other systems, such as Strava, Garmin Connect, etc. 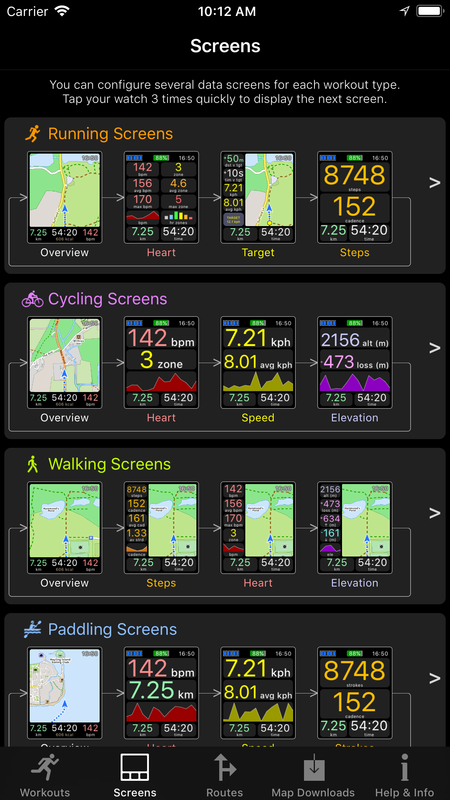 During a workout you can easily cycle between a set of user-configurable data screens. To do this simply tap the display 3 times quickly. For each screen you specify the content (e.g. 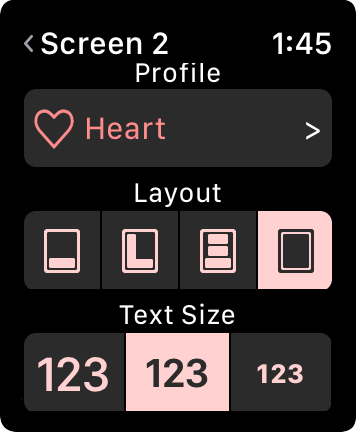 heart, pace, elevation, steps etc); the layout; and the text size. You can configure the data shown on each screen from a pool of over 160 metrics, including mini-graphs and shortcut buttons. This configuration can be performed on either the iPhone (with its greater space) or the Watch. You can specify multiple type of interval notification, such as by distance (e.g. every mile or km), time, steps, ascent, descent, or calories burned. For each type you can control the interval (e.g. every 250m instead of every mile). You can specify multiple types of limit alerts, such as high or low heartrate, pace, speed or cadence. For each type you can specify whether the alert involves haptics, voice and/or on-screen message. 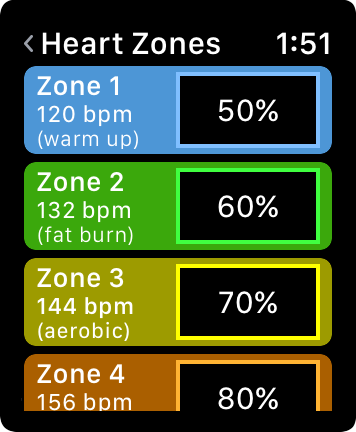 Heart rate zones (e.g. fat burn, aerobic etc) can be configured to allow you to see the amount of time spent in each zone. This is done by specifying minimum and maximum rates and percentages in between for each zone. 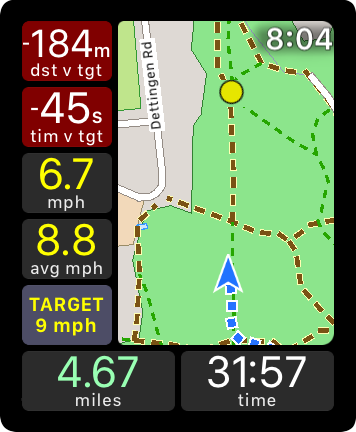 The app allows you to specify a target pace or speed and shows the distance and/or time that you are ahead or behind that target. You can also show the target as a live icon on the map, for extra motivation! You can configure laps to be started manually (by a configurable operation) or automatically using a configurable distance. 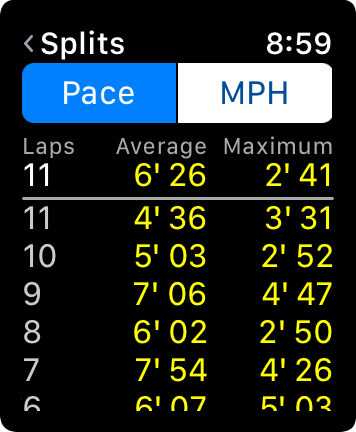 Lap splits for any metric can be examined on the watch during or after the workout and also on the iPhone. You can configure 3 different Rolling Pace metrics, each with your choice of period. For example the last mile, or the last 5 minutes or last 30 seconds. There are 3 metrics to allow you to display them all at once and decide which period you prefer. At any time during the workout you can show a summary screen including graphs and splits. The analysis on the iPhone is even more powerful with the ability to examine many metrics at any point during the workout. 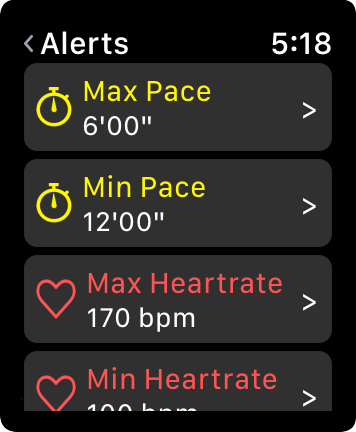 The iPhone app allows workouts to be analysed in great detail, with separate tabs for each aspect of the workout (Pace, Heart, Elevation etc). 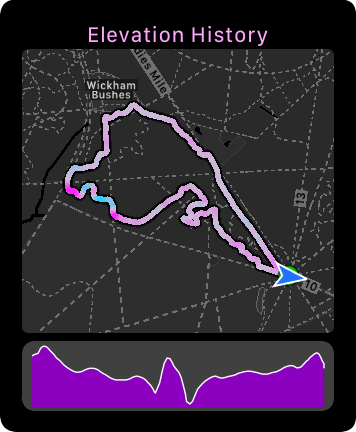 Each tab shows a map and profile of that aspect, together with the ability to tailor what you see (e.g. pace or speed, bpm or zone etc). 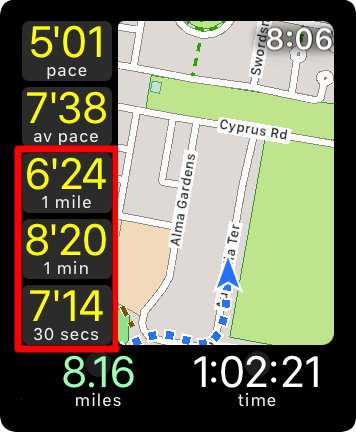 The screen also allows you to see lap splits information for that aspect of the workout. The iPhone app also allows you to configure the information shown on the data screens. 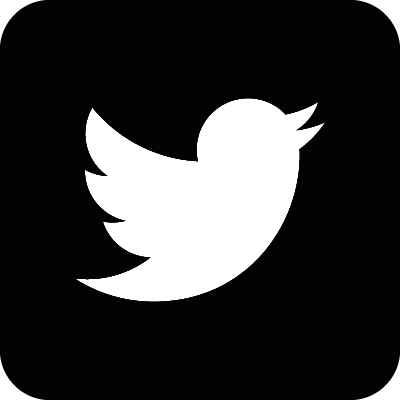 This includes the screen layout and text size as well as the content (e.g. Heart, Pace, Elevation). 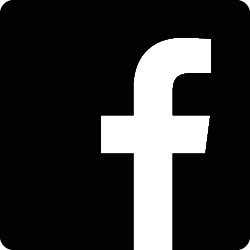 The content can be customised to show exactly the metrics required from a pool over over 160 data fields, including graphs and buttons.